Yesterday saw the first event in the A Bird is Not a Stone tour of Scotland and England, kicking off with a fantastic reading at the Edinburgh International Book Festival. Poets Maya Abu al-Hayyat, Liz Lochhead, Christine de Luca and Alasdair Gray, along with translator Abla Oudeh, all under the very able chairing of Robyn Marsack, thrilled an audience of over 300 with performances of their own poems and those of other contributors to the anthology. 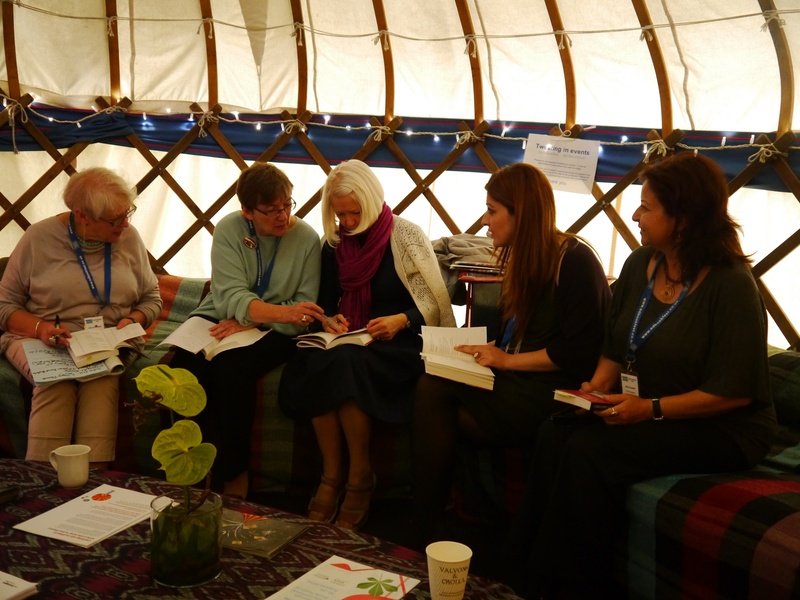 (L-R) Liz Lochhead, Robyn Marsack, Christine de Luca, Maya Abu al-Hayyat and Abla Oudeh in the authors’ tent at Edinburgh International Book Festival, preparing for their readings. The tour continues this afternoon 1-2pm at Word Power Books with readings by Maya, Christine and Abla along with Ryan van Winkle, as part of the Edinburgh Book Fringe. They then head to Glasgow for events at the Glasgow Women’s Library and Tron Theatre, followed by Liverpool (The Brink, 21st August) and Oxford (East Oxford Community Centre, 22nd August).